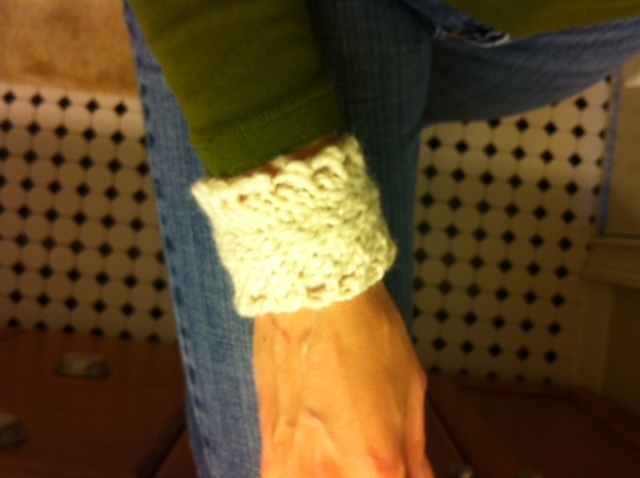 10 Yard Cuffs with retro buttons! Being bit by the spinning bug means being mentally swamped by the potential project bug, at least in my world. I tend to get really focused, and as per my past post, I’m spinning my way through some beautiful BFL and Angora fiber right now. In fact, I had a hysterical dream that someone moved in next to us with a lawn full of angora rabbits…yep, I’m kinda into it. But I digress. Even with the spinning, I still like to knit on the way to work in the mornings. I decided that the sparkly off white that I spun in my recent “car spinning” moment would make great 10 yard cuffs..a Leethal project that I’ve wanted to do. They were so fast to knit that I did one and a half on during the 45 minute commute in..blocked one last night and sewed on buttons this morning. The beauty of cuffs is that if you have two, that’s great, but for an artsy fashion statement you can get away with one or cleverly mismatched. 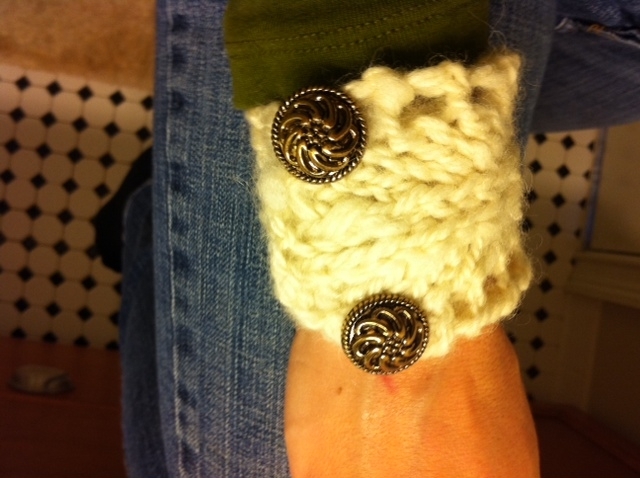 Anywho, I’m sporting an awesome cuff with retro buttons (from my mom, no less) at work today. Rock on. PS. Told my British hubby he better keep an eye on his cufflinks….I have an idea brewing. This entry was posted in Car Spinning, Quick Projects by Leah. Bookmark the permalink.